● A calibration facility requiring two pH buffers is essential i.e. uses pH buffer 4.0 and pH buffer 7.0 for calibration. ● Readability to pH 0.1: Readability to 0.01 is un-necessary for nutrient solutions. Further, accuracy to 0.01 is rarely achievable even when meters are properly maintained. ● Combined millivolt and pH readout. 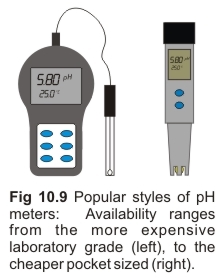 ● Replaceable electrode: This is the component that usually limits the life-span of an electronic pH meter. ● Waterproof housing is desirable. ● Automatic temperature compensation: Standard on most meters. ● Auto-off feature: For prolonging battery life.